Koana Islands (pronounced Co-AHNAH Islands), officially the Republic of Koana Islands is an Oceania country situated in the middle of the Indian Ocean. It’s closest neighbours are Australia to the east, Madagascar to the west and Indonesia to the North. The capital city is Megopolis. The Koana Islands is made up of 32 islands, of which 11 are uninhabited and are national parks. The biggest island, Koana Island has an area of approximately 574,925 square kilometres and is home to the vast majority of Koanians. All up, the 32 islands provide an area of 931,223 square kilometres, roughly the size of Spain and Sweden combined. Oh, and the islands are also completely fictional. These incredible maps are the work of Ian Silva who remarkably has no cartographic training. Silva hopes someday to make a travel guide, though he says he needs to work on the nation’s history and complete its language before he’s ready to talk to any publishers. In the meantime, he says he hopes interest is high enough that other people will start contributing. 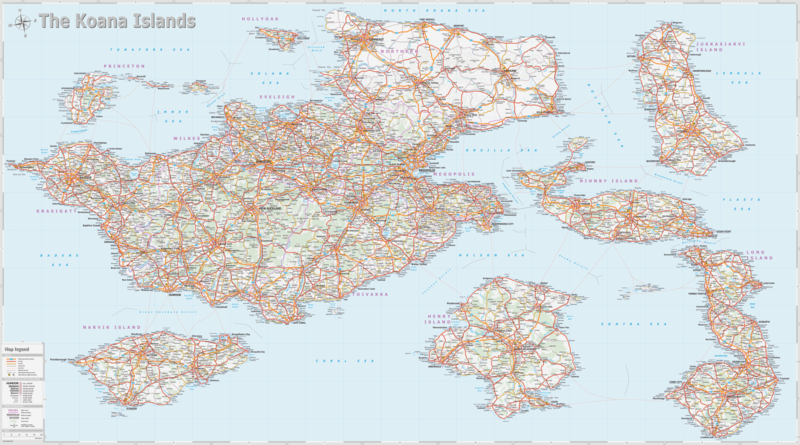 Wired: You Won’t Believe How Insanely Detailed This Guy’s Fictional Maps Are. Seriously. There’s also a Republic of Koana subreddit and a associated wiki. Koana Islands (pronounced Co-AHNAH Islands), officially the Republic of Koana Islands is a fictional Oceania country situated in the middle of the Indian Ocean.